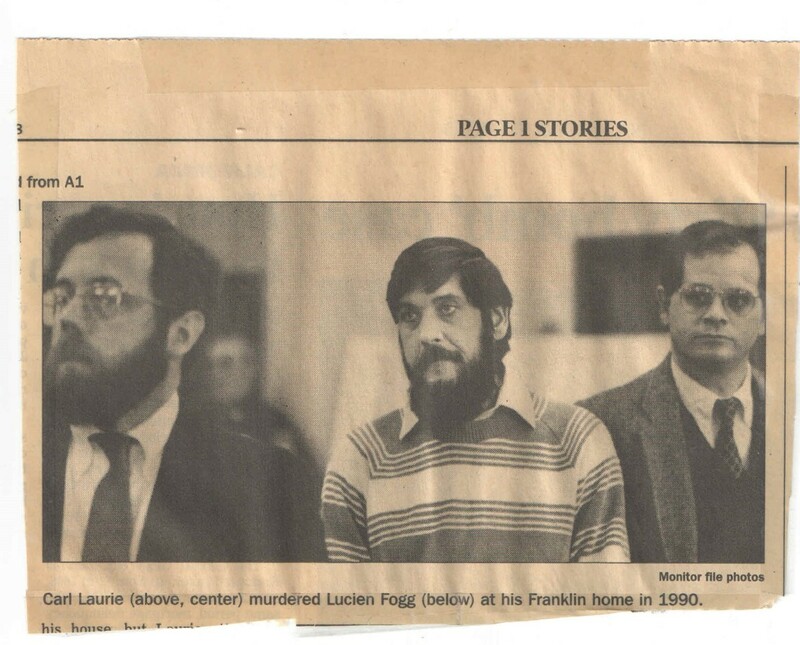 Convicted murderer Carl Laurie, center, is pictured with the lawyers who originally defended him, Albert W. Scherr, left, and James Moir in this clipping from the Concord Monitor in the 1990s. Laurie's conviction was overturned in 1995 because prosecutors allowed a police detective who had been disciplined for dishonesty provide key testimony against him. The state Supreme Court case State v. Laurie prompted prosecutors to keep 'Laurie' lists of police officers with potential credibility issues for possible disclosure to the defense . Introduction to InDepthNH.org’s series about N.H.’s ‘Laurie’ lists and how prosecutors disclose to the defense the names of testifying police officers who have been disciplined for dishonesty or excessive force. I had delayed looking into the lists that I now know as “Laurie” lists – they are called “Brady” lists and “Liar” lists in other states – because I figured there could only be a handful of such police officers in New Hampshire. I thought those would likely be officers who had been disciplined, but were appealing to keep their jobs. Not much of a story? Wrong. What I learned since is there is no way to know how many defendants have been denied their constitutionally guaranteed right to a fair trial in New Hampshire because prosecutors failed to disclose a testifying police officer’s propensity to lie. There is also no way of knowing how many police officers have been wrongly placed on Laurie lists because of human error or internal police politics. How many qualified police officers have been silenced by being falsely designated a Laurie officer? How many drummed out of law enforcement because someone in power just didn’t like them? There is no way to answer those and many more questions because of the secrecy surrounding Laurie issues in New Hampshire, unlike a handful of states where police discipline is considered public information. The New Hampshire Supreme Court handed down the decision State v. Laurie 20 years ago. That case altered the landscape surrounding the state’s obligation to turn over exculpatory impeachment evidence regarding police officers testifying at trial, according to Concord Attorney James Moir. “Since then, however, interpretations of this decision and implementation of its dictates have been sporadic, ignored and structured in such a way that much of what the Supreme Court had wrought was rendered meaningless,” Moir wrote in a history he compiled about the case. Moir and Albert Scherr, now a law professor at the University Of New Hampshire School of Law, defended Carl Laurie at trial. Laurie was convicted of first-degree murder and sentenced to life without parole. “The ‘Laurie’ process is broken,” Moir said. It was because Moir heard through the grapevine after Laurie’s conviction that prosecutors allowed a police officer who had been disciplined for dishonesty to provide key testimony against Laurie that led to the appeal in which the Supreme Court ultimately overturned Laurie’s conviction. William Lyons, who then worked at the Attorney General’s Office before being appointed to a Circuit Court judgeship had called the Franklin police chief to warn him about the same officer – then-Det. Sgt. Steven Laro. “If you had a homicide tonight in Franklin, I instruct you that Sgt. Laro not be involved in the case in any capacity,” Lyons warned. The state Supreme Court quoted Lyons in State v. Laurie. Laurie, 65, is incarcerated at the state prison in Berlin. After his conviction was overturned, he pleaded guilty to a lesser charge with a minimum parole date of April 20, 2009. But Laurie walked away from the North End Transitional Housing Unit in Concord six months before he was to be released and received an escape conviction, according to Jeffrey Lyons, spokesman for the Department of Corrections. He said Laurie will again be eligible for parole in 2025. A number of news outlets have continued reporting on Laurie issues creating public awareness that is now demanding reform. On Wednesday, the Commission on Use of Police Personnel Files, which was created by legislation, will meet at 1 p.m. in Room 303 of the Legislative Office Building across from the State House in Concord. It is chaired by Sen. Sharon Carson, R-Londonderry. On Thursday, the state Supreme Court will hear oral arguments about a Rochester police officer who wants his name taken off the Strafford County Laurie list. On Oct. 13, convicted murderer Eduardo Lopez Jr. will argue why he should get a new trial because prosecutors failed to disclose before he was tried two decades ago that a Nashua police officer who testified against him had previously lied to his superiors. On Monday, Tuesday and Wednesday, InDepthNH.org will publish a series of articles about the Laurie landscape today. We will report on several cases and include original court records and publications to provide as full a picture as possible given the secrecy involved in the system. Police personnel files are confidential by law in New Hampshire. It is being debated now whether even prosecutors can peek inside them. InDepthNH.org will offer all other news outlets free use of these stories as part of our nonprofit mission to increase the amount and quality of investigative reporting in New Hampshire. I had no idea three years ago that this was New Hampshire’s small part in a big, albeit quiet national scandal. It pits the rights of criminal defendants to all favorable, material evidence against the rights of police officers to keep their discipline confidential. It was such a secretive process in New Hampshire three years ago that county attorneys refused at first to say how many officers were on their list as each one usually keeps only the names of officers likely to testify in their jurisdiction. They refused to provide the names – and still do – saying they are protected by law. With some prodding, a right-to-know request, and a decision by the Attorney General’s Office that the number of officers in each county could be released to the public, the New Hampshire Sunday News published a story on Oct. 6, 2012. That was after much back and forth and no small amount of confusion among county attorneys trying to decide whether certain officers should be on or off the list and whether officers who had left the job should be kept on or off and for how long. That debate continues. The Attorney General’s Office recently directed county attorneys to put Laurie officers back on the list if they had removed them after 10 years as directed in the 2004 memo written by former Attorney General Peter Heed. One county attorney early on told me his jurisdiction had never had a Laurie list or anyone who should be on one, although that couldn’t have been true because the state police with such a designation are supposed to be kept by each county attorney along with those from their own jurisdiction. Three years ago, then-Assistant Safety Commissioner Earl Sweeney conceded state police had not been in full compliance with reporting officers with credibility issues to county attorneys and the Attorney General’s Office, but would certainly do so in the future. Another county attorney told me that it wasn’t his job to go looking for dishonest police officers to put on a list when it is in fact an important part of the responsibilities of his elected office to do just that. All prosecutors are responsible for making sure defendants get their constitutional right to all material, favorable evidence. That includes discipline buried in confidential police personnel files that could reflect negatively on an officer’s ability to testify truthfully, which could then be used by the defense to impeach an officer’s testimony. As Moir noted in his history, a new law was passed in 2012 that is still not fully implemented causing more confusion. Defendants on trial in Minnesota and some other states are more likely to benefit from their rights under Brady because police discipline is a matter of public record. As Abel writes, the stakes are high all around and the tension very real. This has been one of the most vexing issues to come before the legislature. It is amazing how, two decades after the Laurie case and a decade after the Heed Memo, the legislature has still not developed and passed a comprehensive law to deal with Brady/Laurie List issues. About a year ago, I was driving down Chestnut Hill Rd. in Amherst. It is steep and windy. I came around a curve and encountered a police car blocking the right lane. I hit my brakes and swerved to avoid the police car, and saw a police officer walking back from an SUV he had stopped towards his car, carrying her licence and registration. I was going about 15-20 mph at the time. Before I braked I was going 30-35. There is a 30 mph speed limit. He waved me over, and I stopped. When he was through with the other driver, he walked up to my car and handed me a ticket for going 55 mph – which stated that he had clocked me on his radar. I pointed out that he was outside his car when he stopped me and had been talking with the other driver. He said, well contest it in court if you want to, but I will state that I was in my car and observed your speed on my radar. I said, “Well if you do that, it will be perjury!” He shrugged and returned to his car. I stopped at the Amherst police station to report this to his supervisor. He kept me waiting about 15 minutes, and I told him my story. He said, are you accusing my officer of perjury, because if you are I will arrest you! I was very surprised to find the police in a town like Amherst so corrupt. If they will lie and cover up over a traffic ticket, they will lie about anything!